If you were born in America with the name Dayton, there is a high probability that you descend from our common progenitor Ralph Dayton, my 8th great-grandfather. I descend from Ralph> Samuel> Abraham> Henry> David Senior> David Junior> Henry> Charles> Wilber (our grandfather). My brother and I enjoy contact with extended family and like-minded friends, so this blog has been created in order that we might establish contact and prompt discussion. From October 2016 to December 2018, over 150 posts were added to this site, most having to do with our first six generations of Dayton ancestors in America. In December 2018, I decided to take a break but continue to monitor the site. Today (March 5, 2019), I am cancer-free, gaining strength, and plan to resume work on a second book. 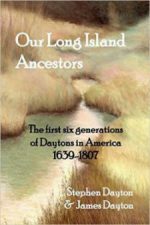 Our decades of research have been gathered into a compilation of records and interpretation entitled Our Long Island Ancestors, the First Six Generations of Daytons in America, 1639-1807. The original intent was to preserve discoveries for the larger Dayton family in the form of a book that might read as a story. The book is available in both hardcover and paperback, but a PDF version can be found on Archive.org and should also be available on Familysearch.org in a few months. The book is not for profit, with proceeds going to Long Island historical societies. Special Note: Please be aware of a few malicious sites advertising PDF downloads of our book which do not exist. Do not open these dangerous sites. You are encouraged to leave a comment or ask a question at the end of any post. However, if you prefer to contact us privately and securely, please use the contact form on the Contact page. Earlier this week, I started writing our second book. Actually, it’s more of an outline for now, but I intend to accumulate text over the next few years, with Jim providing information and editing as needed. It will be a continuation of our story, adding four more generations to the previous six in the first book. These additional four lived in Hadley, New York. The book begins with Long Islander David Junior and wife Chloe Skiff moving to Hadley and will include his son Henry and his wife Christie Ann Cameron, grandson Charles and his wife Nancy Goodnow and great grandson Wilbur and his wife Jesse Belle White. With the approach of the Mayflower 400th anniversary celebration, descendants of David (son of David Sr), Henry (son of David Jr) and Charles Dayton (son of Henry) should be aware that much of your work to establish descent from Mayflower passengers is already complete. Recognition has recently been received from the Alabama Mayflower Society for both John Tilley and John Billington lines. Ascent for Tilley is from Ralph>Samuel (c1624-1690) > Abraham (c1654-c1726) > Henry (c1704-1759) > David Sr (c1739-1782) > David Jr (1766-1807), through David’s wife Chloe Skiff. Ascent for Billington is from Ralph>Samuel (c1624-1690) > Abraham (c1654-c1726) > Henry (c1704-1759) > David Sr (c1739-1782) > David Jr (1766-1807) > Henry (1792-1849) > Charles (1732-1882) through Charles’s wife, Nancy Goodnow. Much of this post contains quotation from page 37 of our book. Ralph Dayton…born 1588/9 Great Bentley, Essex, England…both of the Parish. Edson isolated this notation by making use of the Latin abbreviation “q.v,” (quod videre) to separate personal notes requiring investigation from actual record, coming before and after the phrase in question. Its origin of the idea for the note is unknown. Since Shaw said in his letter that Edson Dayton, “wanted proof of every statement he makes in his book,” the fact that Edson didn’t use this birthplace for Ralph in his book says to us that he did not believe it to be reliable. My brother Jim secured and examined microfilmed photography of the Great Bentley registry for that time period [courtesy LDS Family/History Library, Salt Lake City], but the pages were too tattered and faded to be legible. If the Great Bentley record were to ever be found in the church record, as unlikely as that is, we imagine it was as if Ralph told the vicar on the occasion of his marriage to Alice that he was born there. Great Bentley, Essex is located about halfway between Colchester and Clacton-On-Sea, about ten miles from each, and is about 100 miles north of Ashford, Kent. As the search for pre-1617 records of Ralph Dayton continues, I often wonder if Ralph had another marriage previous to wedding 30 year old Alice Goldhatch Tritton. Alice was a widow with two daughters (Bennet and Rose) and, at his estimated age of 29 or 30, there is no reason to assume that this was Ralph’s first marriage. If Ralph had been married previous to 1617, the couple probably lived at another location since there is no record of Ralph in the Ashford parish registries prior to his marriage to Alice at St. Mary’s. Because there is no record of Ralph’s children prior to his first with Alice, Ralph Junior, we should not conclude that this disqualifies the possibility. If such children existed, it may be safe to conclude that they were probably daughters since Ralph Junior, as eldest son, received his father’s name. Remember, Ralph Senior’s son Samuel and his son Abraham both “disposed” children, so that possibility also exists for children of Ralph prior to his marriage to Alice. With Jim’s permission, I am adding his PDF which charts five generations from Ralph Dayton forward. Always a work in progress, he hopes it is helpful to many. Since it seems like many of the inquiries I receive from readers and from distant relatives have to do with lines descending from Connecticut Daytons, it might be fitting to repeat some interesting facts and speculation having to do with Caleb, son of Abraham, son of Samuel, son of Ralph. Most of this post contains copy from our book, beginning on page 284. Caleb was born to Abraham and Mary, before Abraham married Katharine (Catherine). Apparently Caleb’s mother died shortly after his birth, about 1687 in Brookhaven, NY. Catherine’s first-born was Abraham’s second known son Jonathan, born about 1694. Catherine would have at least four additional children before about 1704, at which time Abraham was fifty and she was probably in her late thirties. On May 12, 1696, Abraham bequeathed his son Caleb “Daighton,” then aged 8 years and 5 months, to William and Jane Rawlinson, of Stratford, CT. Some knowledge of the Rawlinsons might be gained from the Stratford Episcopal Church where Rawlinson was a member and was probably warden.